I don't do extreme sport. I don't really do common or garden sport. In the words of George Burns, 'I never go jogging: it makes me spill my martini.' If some fuckwit decides to go up a mountain or into a canyon on his own, without telling anyone about it, and then gets his arm trapped under a boulder, I basically have no sympathy. I mean, I'm glad said fuckwit survived, but do I really want to watch a dreary, dismal, against-all-odds movie where we basically spend 90 minutes watching a bloke drinking his own urine and then hacking off his arm with a blunt knife? No. 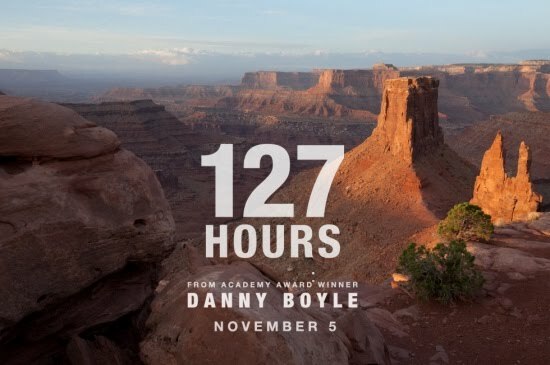 The triumph of writer-director Danny Boyle is that 127 HOURS is NOT that movie. He brings all the energy, visual style and bravura editing of SLUMDOG MILLIONAIRE and TRAINSPOTTING to a story that could've been claustrophobic and grim. Better still, he had the faith to cast James Franco in the central role of real-life canyoneer Aron Ralston - an actor who is pretty, no doubt, but also very gifted and only now starting to get roles that show his potential. The movie begins with a hi-energy, thumping sound-track from A.R.Rahman, and split screen footage of urban life - crowds of people and noise - trading floors and sports stadia. We see Franco's Ralston grab a map, some supplies, his cam-corder, jump in a car, music blaring, and head for the Canyon. This is clearly a guy full of energy, personable, but basically too busy to bother checking in. He's on the move - looking for that perfect outdoor sports high. And Boyle tells us all this without any dialogue - just some bravura editing and a really original approach to the material. When we get to the Blue John Canyon, we see Aron charm the pants off two lost hikers, showing them the joy of dropping into an underground pool. Again, it's a brief episode but sketches in his character - good fun, witty, and a dare-devil. Tellingly, just as Aron ran out of the store not even turning to wave goodbye but impatient to move on to the next thing, he runs off from the girls, waving without turning. It's all about the next adventure. Before we've even paused for breathe, Aron's dropped into a canyon, the boulder has crushed his arm, and he's realised, mid-swigging from his water-bottle, that he's "in deep doo-doo." And for the first time, the camera pans out from the ravine, out of the canyon, and there isn't any rock music on the sound-track. It's a great contrast to the first half hour of the flick. What then follows is some superb acting from James Franco, as he portrays a man who veers from pragmatic, ingenious engineer to delusional, dehydrated hysteria. And Franco is matched point for point by Boyle's inventive use of the camera. From inside-the-water-bottle POV shots, to quick edits of Aron's delusional visions - the movie never loses pace or interest despite the constraints of basically shooting a guy in a ravine. (Admittedly, Boyle is helped by the fact that the real-life Ralston really did cam-cord himself, giving the screenwriters a neat device to break the silence and alter the POV.) In fact, far from being grim, 127 HOURS is often very funny indeed. And, most importantly, by making us enjoy Aron's company, and by making us see what he has to go home to, the movie makes us completely invest in his survival. As a result, when Aron finally has to break his arm and then cut through it to free himself, the audience gasped in horror at his pain, and cheered with joy when he finally escaped the trap. And when he finally saw a family in the distance, and the helicopter came for him, the feeling of relief and catharsis was palpable. I practically bounced out of the cinema on a natural high. So, whether or not you typically like extreme-sport-survivor movies, you should definitely check out 127 HOURS. To use that most hackneyed of phrases, it really is a feel-good film of the best kind - a movie that earns its warm fuzzy glow by making you identify with its protagonist and taking you through what feels like authentic pain. The resulting film is full of energy, emotionally engaging, brilliantly acted, and technically imaginative. I think it's Danny Boyle's finest film to date, and certainly James Franco's best performance - combining the talent for comedy shown in PINEAPPLE EXPRESS with the ability to show real emotion seen in HOWL and MILK. 127 HOURS played Telluride and Toronto 2010. It opens in the US on November 5th 2010 and in the UK on January 7th 2011. What a superb film. I echo everything you've said in your review, Bina007. Must say I especially appreciated the "I am not a hero" tone, which I think rang sincere the whole way through. From the interviews I've just watched on YouTube the real Aron Ralston feels the same way. And that humility and vulnerability is precisely what draws us to him as a character. His confessionals into the camcorder were great. And that there was no explicit "God, I promise to really appreciate life to its fullest if you get me out of here!" messages, which, had it not been Danny Boyle or, say, Brett Ratner or some other Hollywood (hack) director, I'm sure that kind of message would have been all over this movie. Don't know if I'm going to watch this again any time soon - I must admit I was wincing pretty heavily through the you-know-what scene - but in a few years I'll look forward to experiencing 127 Hours again.